Aseem Soni, CEO and Board Member of Modern Foods spoke to Restaurantindia.in on the occasion of announcement of re-launching of Modern brand in Mumbai. Modern Foods has recently re-launched its brand with adding eight new variants along with new packaging and advertising. It has introduced Multigrain Supersedemade from various seeds, whole wheat, Atta Shakti, and Hi-Fibre Brown along with a Milk Plus bread. The range is primarily targeted at young consumers, millennial and Indian women. Initially the range has been launched in Mumbai, Thane and Raigarh region. Thus, further briefing about future brand strategies of venturing into new categories and expanding the presence in north and west market by tying up with third party manufacturers. What is new that you are offering with this re-launching? We have re-launched Modern brand with eight new variants along with new packaging and advertising. We have introduced healthy breads including Multigrain Supersede, made from various seeds, whole wheat, Atta Shakti, and Hi-Fibre Brown along with a Milk Plus bread aimed at school-going children who need nutrition. With this range we are targeting younger consumers, millennial and the new Indian women. What is the consumer study that you have done before diversifying your product portfolio? We have extensively reached to the consumer in their homes and understood what does she wants from our basic breads. Whatever she told us we made a portfolio on the basis of that. We have taken care of her needs of new recipes addressing the occasions of use, addressing the need that she has to offer a tasty and healthy and nutritious meal to her family every day, so all that is covered in this portfolio. Which are the markets you are primarily tapping with this new range of bread? We have already launched this range of bread Mumbai, Thane and Raigarh and other places. This area contributes 15 percent of our market share. What is the total retail reach of your product? Countrywide we have close to Rs 1 lakh MBO outlets. And there is no target fixed to expand to. Every city has got a target and there are different initiatives at different point of time. It’s a journey that happens every day every week. What is your future strategy? Cakes and busts is a new category we are looking at, so by the end of this year we should be entering in this category. We are planning to introduce its new line of ready-to-eat Indian breads (paranthas and rotis) along with indulgent baked goods in the country. Currently we are piloting this category in South India. Also, we are setting up a new vertical within the organization for baked goods—cakes, portion cakes, muffins, cream-filled goods etc. By the end of this year, we will have a very exciting portfolio. Going forward, we are looking to expand our distribution by 50 percent (within Mumbai) and our revenues by 25 percent. Further, we are planning to expand our presence in north and west market by tying up with third party manufacturers. Also, we are completely open for new acquisitions of local bakeries with turnover of nearly Rs 100 cr and having strong manufacturing capabilities. Presently we have six manufacturing plants with four in south, one in Mumbai and one in Kolkata. We have set up a new innovation centre in Chennai last year and this new range is been done there. What is your current revenue? Last fiscal we have closed at Rs 270 cr. 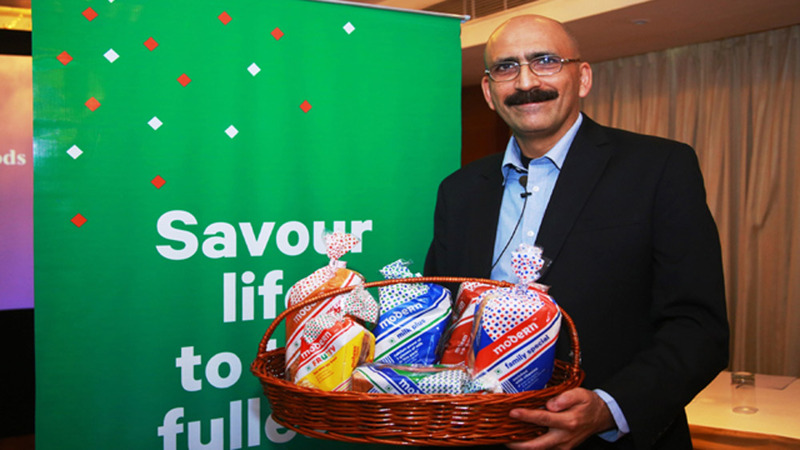 The organic bread business will grow towards Rs 450 cr. Further Rs 300cr revenue will come out of the whole new vertical and the new acquisitions of locally strong bakeries will be the building blocks for the Rs 1000 cr revenue to be achieved by 2021. We expect a third of Rs 1000cr revenues to come from non-bread business. According to you how big is the bread market in India? According to Euromonitor report the market for bread in India is between Rs 6,500-Rs7,000 crore out of the total baked goods market which is worth Rs 27,000 crore. Total urban penetration of bread in India is at 34 percent.